Afternoon tea takes places in the old-world elegance of the King Cole Bar and is accompanied by music from the resident pianist. Menu offerings include finger sandwiches, lobster pie, smoked salmon, and freshly baked scones. Satisfy your sweet tooth with chocolates, cakes, ice cream, and house-made praline. Children age 9 – 12 will be charged a discounted rate of IDR100,000 (USD11.50) and children under the age of 9 dine for free. 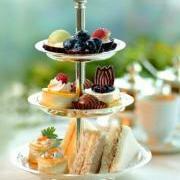 The quoted prices for afternoon tea are inclusive of 11% local taxes and 10% service charge. For more information about afternoon tea at the St. Regis Bali visit their website. Reservations are highly recommended and can be made by calling (62) 361 300 6782.